When patients call their provider about a health concern but are put on hold or are unable to get the information they need, the delay is frustrating and a roadblock to receiving timely care. That is why when our patients told us they want faster and better service when calling their providers, Virginia Mason made improving call center performance a priority. This type of care, which focuses on the needs of the patient, is what sets Virginia Mason apart and is made possible through the generosity of our supporters. The goal is to have all questions answered in a single call and all calls answered in three rings (about 20 seconds). Every department has shown significant improvements and many are consistently hitting or exceeding the goals. Ongoing training, use of real-time analysis of call data and using feedback from patients is helping team members continue to improve the service. The next phase is the implementation of a virtual call center, allowing more team members to answer calls from a variety of locations which will further expand patient access to care. The partnership with our patients and supporters helps us to create the best experience possible for those seeking care every time they visit – or call – Virginia Mason. Virginia Mason has joined the digital age by launching our very own mobile app. 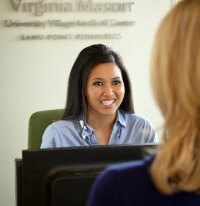 Designed to simplify our patients’ digital experience and be a one-stop-shop for their mobile device, the new Virginia Mason app will allow patients to book an appointment, refill a prescription, and get directions to the nearest Virginia Mason location from the user’s phone or tablet. 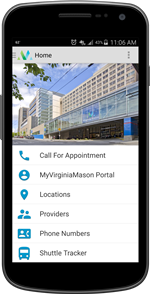 Available for Apple and Android devices, the Virginia Mason app was developed to enhance the patient experience. For more information, please contact our team at mobiledev@virginiamason.org.